Bardulf is the main vilan of the story, at least at the very beginning. Through treachery and a touch of magic, the dark prince used the mysterious Ring of Emeth to bewitch UR’s princess, whose proud beauty fascinates him. By placing the ring on her finger, she immediately fell under his spell. Intending to marry UR’s princess himself, he planned to secure the rich kingdom of UR for himself, With ambitions to conquer the whole of the Mid-Realm, the subduing of UR through political marriage was only his first step towards this goal. Although he lost the princess due to the incompetence of his soldiers, he knows the loss is only temporary. He can always find her with help from the ring of Emeth. A dragon-lizard named Gryth is attracted to the ring. 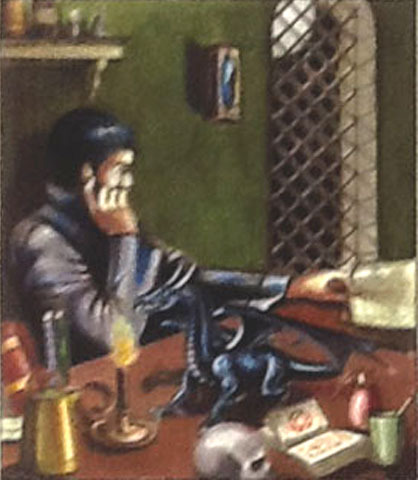 Through the dragon-lizard’s connection, he is able to “watch” Jasmine’s progress from afar. Jasmine cannot remove the ring. In the meanwhile, Bardulf pretends to the King of UR, pretends that the princess is in his stronghold, and that she has already consented to be his Queen. I would have said that the above text is also from Installment 13. But after comparing it with the actual panel (below), I find that it is not. There is more and better information in my notes. I think space limitations caused me to abbreviate the ideas stated above. 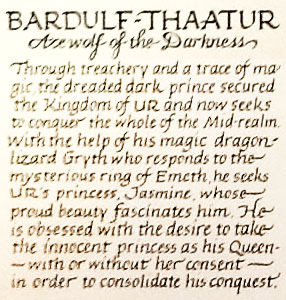 This is the text accompanying Bardulf’s illustration. It’s from the 1st panel of Installment 13. This entry was posted in Calligraphy As Art, Jasmine & Role Playing Games, The Creative Process and tagged Bardulf, dragon-lizard, Gryth, Jasmine, ring of Emeth, The Story of Jasmine, UR on February 8, 2018 by Darlene.